Elan 340 G-whizz After misjudging our run for the line we are behind at the start. 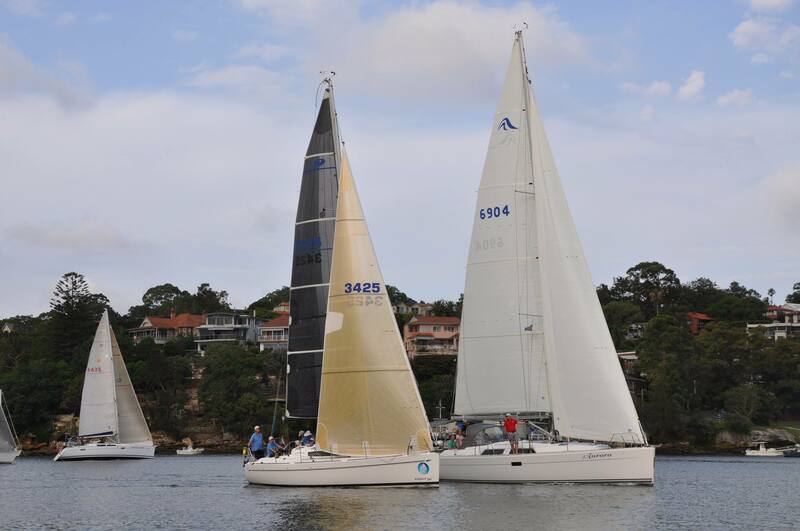 Sixty five yachts fronted up to the starter for the first race in the Autumn Series, thirteen of them in Blue division. The winds were a little above the comfort zone for Wes the light weight number 1, requiring Graham on the main to be on alert, he really earned his beer after the race. Our start was less than perfect as we were unable to pick our way through some starboard tackers to get to our desired position. We were able to make up ground on most of the field with the exception of Agrovation, Worlds Apart and Aetos, still a fourth fastest was not a bad result, pretty close to our objective of finishing the the top three. The following photos have been lifted from the GFS Facebook page, were taken by Kathryn and posted by Simon Elliott. 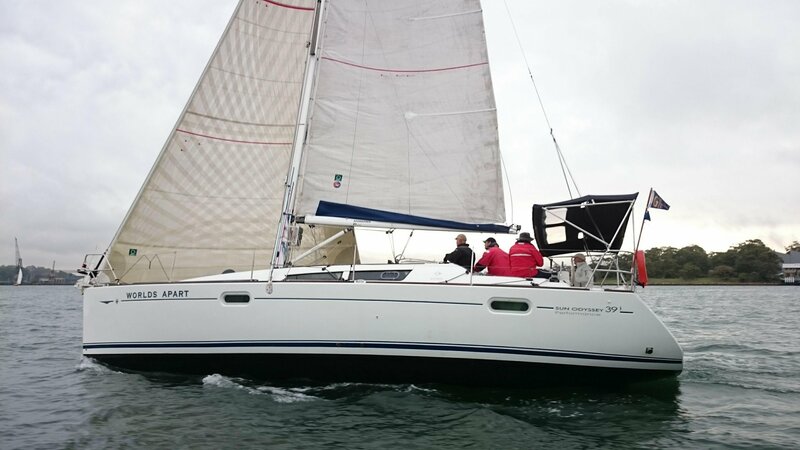 Elan 340 G-whizz Leading a pack through Humbug. Unfortunately not enough of them are in our division. Elan 340 G-whizz nicely powered up heading for the finish in light air. Elan 340 | G-whizz. Summer Series Twighlight Racing. Our postings here have been a little scant of late, however some recent results have motivated us to say something. It may be bragging and/or narcissistic (or are the same?) to point out how well G-whizz performed in the GFS summer twilight season. G-whizz competes against various Jeanneaus (36i, 39i, 379), Northshore 38, Hanse 40 and Dehler 38 amongst others. G-whizz is very much the smallest boat in the division, about 1.2 meters shorter than the division’s average length. The picture to the left visually illustrates the size variance between G-whizz and one of her competitors, in this case Aurora a Delher 38. If you are reading this you will probably already know that G-whizz is an Elan 340, she has a long water line compared to her overall length and was designed by Rob Humphries to perform well in light air. This works in our favour as most twighlight races at GFS are held in winds below 12 knots reducing as the evening temperature cools, while not being an super lightweight, she is lighter than most of her competitors and accelerates quicker than her competitors in the fickle winds that we race in. Visitors to her can be somewhat amazed when they go below, expecting to see a gutted out race boat, they are surprised to see a performance cruiser that is kept in full cruising mode. We only need to put food and drink on board to be ready her for an cruise. I have digressed a little from the subject which is about the 2018-2019 GFS Summer Twighlight racing season, the majority of competitors in these twilight races compete in good spirits balancing the social aspect of these events with the competative aspect, we all like to do well while having fun doing well. Well we did well in the summer series, winning it on both scratch and on handicap. I have mentioned before that we judge our performance on scratch results, while it is the PHS result that awards the bottles of wine and on which most results are determined at GFS, it is the scratch result on which we judge our performance, a finish in the top 3 or 4 on scratch is an indication of a good performance. In this series we won on both scratch (ahead of Words Apart on a count back) and handicap. The last race of the series was the GFS Australia Day Regatta event, our win on handicap in this race means that we get to go to the Sydney Town Hall to receive our trophy. All in all a pretty good result. This is by far the best result we have achieved and we have been trying to work out how we performed so well. There are a few obvious reasons. Most of the races have been held in wind strengths in the 5 to 12 knot range, right in G-whizz’s sweet spot. We have changed G-whizz’s bottom maintenance regime, while this should not make a difference, she does feel very slippery through the water. We had a consistent and competent crew through the season. As a crew we are learning more about reading the wind, by no means are we experts but we are now getting it right more than wrong. One thing that comes to mind, although counter intuitive is that because of Christmas/Boxing day, New Years Eve and day and Australia day cruising we have kept the water tanks full, we have done the majority of the season with full or near to full water tanks, on thinking back we can recall that a number of our better results have come with full water tanks. There are two 100 litre tanks located on either side of the keel at or just below the water line, this is probably telling us something, just what I’m not too sure but we will be leaving the tanks full until we work it out. For a number of reasons posts on this site have been pretty scarce of late, I will catch up as there is a bit to write about. 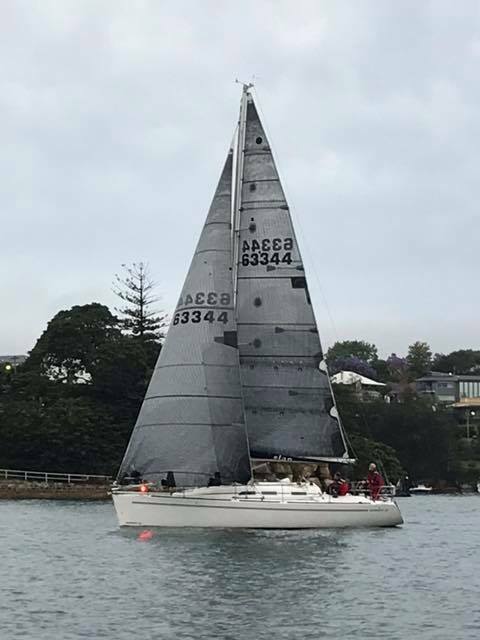 Mostly those writing are about us (well it is our web site after all) but this post is more about basking in the reflected glory of one of our friends, Ausreo (Calliban II) owned and skippered by Ian Creak, Ausreo is also crewed by a number of associates and members of GFS. As the title to this post says Ausreo won her division (IRC Div 4) in the 2018 Rolex Sydney Hobart. Ian won a couple of nice trophies for his, the crew’s and the boat’s efforts, while these will look good in either his office or pool room at home, a video has been produced that will look good forever on the internet, it is well worth a look. Last Across the Line, but Safe. 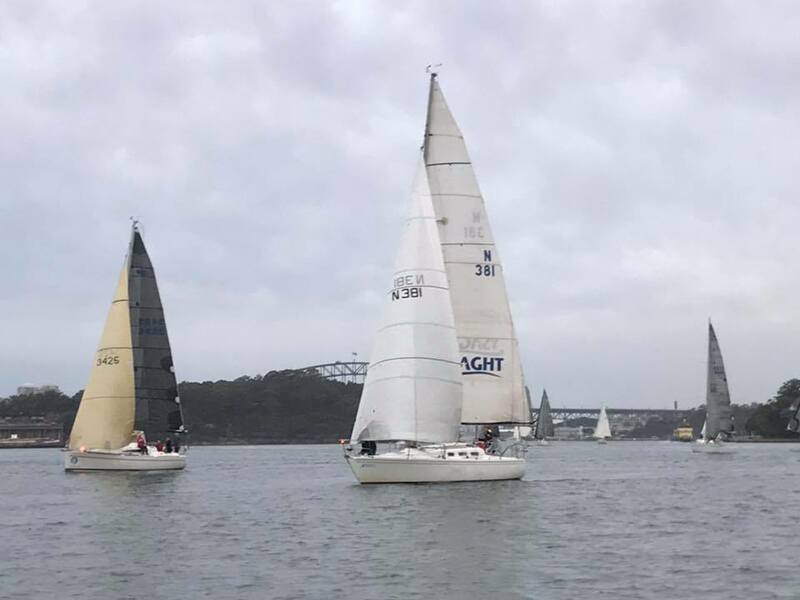 The Twilight race on the 21st of November could be described as a bit weird, it started in relatively normal conditions, well about as normal as the conditions can be when there is a Nor’ wester blowing on Sydney Harbour. A brief explanation, North westerly winds are common in spring in Sydney, they generally do not act as forecast and in our sailing area can create some unpredictable topographically induced shifts. On this evening the wind was behaving itself, 12 boats started and made their way through Humbug, then almost as if choreographed in the vicinity of Greenwich Point most of the starters lined up like a social raft up, and stayed that way on the run down to Goat Island. A crew member could have literally hopped from boat to boat across the whole fleet, this was broken a little when the line of yachts came up to a tall ship on a party cruise, we were fortunately the leeward boat and decided to pass the obstruction to leeward. we couldn’t see it but we could hear on-water rule discussions coming from the other side the tall ship, unfortunately we could also hear some fibreglass to fibreglass contacts. I think we chose the better strategy. The rounding of the Goat Island Buoy was an experience with about six yachts all trying to get into a space that would normally only be large enough for one. Again there was much discussion about the rules and unfortunately again some contact, one of which generated a protest, this was right beside us and we took the safe option of getting clear of the ensuing melee as quickly and safely as possible. This was most fortuitous as about 5 minutes later the fleet was hit with a rain squall, we eased sheets to completely de-power the sails but not allow them to flog uncontrollably and we had the room to let the boat go where she wanted to go, after the worst had passed we pulled on the main and started sailing again. in hind sight I made a bad call, we should have trimmed the main to keep sailing, albeit with as little power as possible allowing us to continue sailing our own course and probably getting a far better result, right or wrong strategy it did mean that we didn’t suffer any damage, the boat basically stayed vertical and the worst that happened to the crew was a severe rendering. At one stage there was a call on board from a crew member asking if anyone wanted there wet weather jackets, but by the time answers were received it was too late. We later heard that there were some yachts that finished in water too shallow to navigate and also against the Balmain sea wall, there apparently were a also number of damaged sails an some rigging damage, fortunately no damage to humans. While no one was concentrating on the instruments we did see over 31 knots (good fun with a yacht rigged for 10 – 15 knots, as most yachts were). There were some reports of wind speeds in the mid 40’s. The adjacent photo is a still from a go pro camera on David Edmiston’s “Passion X”. After the squall passed there was, as is usual after such events in Sydney, beautiful weather, very light breezes and we were stone motherless last, but no damage and happy to have got away “Scott Free”. KoKo struggling in very little wind. Photo John Mackay. The forecast was for a pretty fresh southerly wind that was to be increasing through the evening, but what happened was something quite different. Given the forecast it was incredible that the race committee were at about 5:00 pm considering abandoning due to a lack of wind, further complicated with an incoming tide that could make it difficult to get out of Humbug. We decided to hoist “Reg“, the heavy number 1 up the forestay, while the light weight number 1 “Wes” was the first choice there was still a chance that the wind might fill in and Reg can handle light winds without loosing too much and pretty fresh winds while still giving a pretty good degree of control. 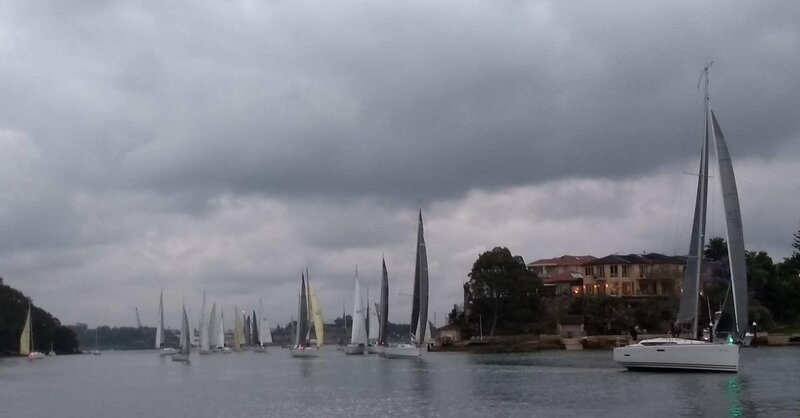 but the wind just got lighter as the race progressed, contrary to the forecast, but I guess that’s Sydney in spring. G-.whizz and Aetos fighting it out at about one and a half knots. Photo John Mackay. Worlds Apart powered up in one of the brief moments of anything that resembled wind. Photo Simon Elliot. G-whizz trailing Aetos rounding Greenwich Point, Photo Simon Elliot. rest of the fleet. 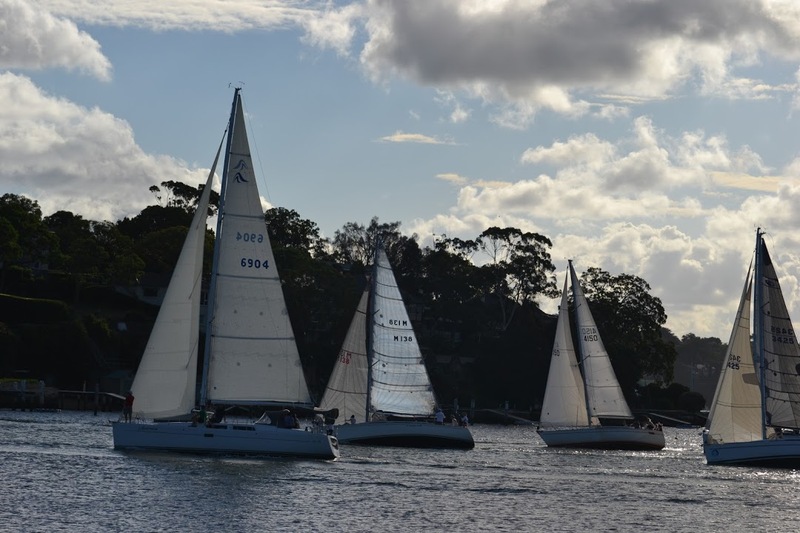 A fourth on scratch (As well as a fourth on handicap) is up there where we want to be, and a beautiful evening on the water where the expected wind and rain did not eventuate was a real bonus. The conditions this evening were not uncommon for the West Harbour sailing area, a South to Sou’Easter of around 10 to 15 knots dropping out to not much around sunset. What was not uncommon though was that David Leslie was giving his new to them Elan 37 KoKo its first outing in twighlight racing, Obviously we had a challenge! No need to read to the end, they beat us. The start was not our best, we were a bit early on the final run down the line, and while I wanted to start at the windward end we were getting there a little early, in our efforts to correct this we found ourselves in a position where we could not muscle ourselves to the line on the gun. “Agrovation” an “KoKo” along with “French Connection” and a couple of others timed their start to perfection and were well on the way through Humbug while we contended with a situation where 4 or 5 boats wanted to be in exactly the same part on the Lane Cove River, there was “Conquitser” a Farr 36 pinching up along the the line of moored boats towards Onions Point, then us doing our best to keep up speed in the fickle winds and contending with the disturbed air from Worlds Apart (Chris Stannard’s Jeanneau 39i), there was another boat to windward of “Worlds Apart” but I have absolutely no idea of who it was, there may have been more in the line to windward but we were a bit busy to see. “Saoirse” the Dehler 38 found themselves in that horrible situation where they were clear astern of the 3 of us but got a bit of a puff and accelerated towards our stern, somehow we all found the inches to give him some room, however not without the obligatory on water rules discussion, probably led by myself with something along the line of “You are the overtaking boat, you have no rights!” A nasty situation was avoided with common sense and good seamanship from all involved, we are still all friends but geez it was close! The course was a Port rounding of Goat Island and back to the finish, for reasons that too ka little while to identify we were unable to find optimum speed or height for quite some time, until a few judicious adjustments to the headsail sheet car position and back stay adjustments gave us the speed that G-whizz is capable of giving, we had some hope of getting near the leaders but when a Sydney Ferry came up behind us we had too pinch up to give him room to pass between us between the “Dolphins” in Snails Bay and us, He also took his time to pass us, travelling quite slowly to ensure the safety of both of us. Unfortunately it did cost us quite a bit of time, but that is one of the “Joys” of racing on a busy working harbour. We continued aground Goat Island and took off on the run back to the finish in Mid field able to stay ahead of the boats behind but unable to make any ground on those ahead until we rounded Greenwich Point and saw about 25 to 20 boats parked windless in an counter accommodating tide (Now isn’t that a weird way of saying the tide was against them?) they were all towards the western Shore of Humbug, the generally accepted place to be in these conditions. I decided that if we were going to get past them we would need to do something different, that we did, taking a course along the Eastern side of Humbug, reasoning that we would be in less tide and would give us the first use of any wind that existed as it was now tending from the East. It worked, we sailed right around the fleet and finished third on scratch, behind “KoKo” and “Agrovation” who had finished minutes ahead of us. After the race while we were dropping sails, Chris Stannard sailed up to us and said “We could almost hear your motor running” while obviously in jest it must have been frustrating to be stuck going nowhere while a competitor just sails by. A couple of years ago when we race against David and Elaine Edmiston’s “Passion” a Jenneau Sun Odyssey 37 (Since replaced by “Passion X” a Didi 40CR) with both G-whizz and Michael Groves “Agrovation” we’d joke that the time period between the finish of the race and the publication of the race report on David’s excellent blog was directly related to David’s performance in that race. Well I have to admit we are not that much different on G-whizz, commitments mean that I have little time to update this blog, I would normally wait until Sunday before writing something, but after last evening’s result I just had to make time to write this. Am I happy with last evening’s result? You bet I am! The forecast was for a southerly that would abate as the afternoon/evening progressed, the strength was forecast (depending on the forecaster) between 13 to 18 knots, generally in the area where we race the wind will be softer than forecast as the evening progresses. After a bit of discussion we decided on “Bas” our number 3 knowing that we would have good control to windward but would suffer on the reaches an runs, especially if the wind did drop out. If we were racing for sheep stations we would probably set up for “On-the-fly sail changes, but we race for substantial less and while Twilight racing at GFS is exceptionally competitive it is also social and fun for most crews. After watching the carnage of the Black division start, with almost the entire fleet attacking the pin on the western side of the the start line, very much the favoured end, I decided to hold back a bit and avoid any potential mess in our start and look for a bit of clear air and water. We started a bit lower to the fleet but with clear air we able to lift above all but two boats before the first tack on the eastern side of Humbug, on the work to the south Eastern corner of Cockatoo Island we consolidated our position by being able to point constantly higher than the fleet, with Agrovation (Jeanneau 379) an Izzi (Northshore 38) well ahead we settled into and interesting battle with Words Apart (Jeanneau 29i) and Saoirse (Dehler 38), making up time on them on the works and in the light air while losing out on the reaches and runs and when the wind picked up. The above pattern of the race continued all the way around Cockatoo Island, around Goat island and back through Humbug, (About the racing area here) the three of us, G-whizz, Worlds Apart and Saorise all entered humbug from slightly different angles, us substantially to leeward, Saorise to windward lose to Greenwich Point and Words Apart somewhere in between. About 300 meters from the finish line the three of us came together, Soarise slightly ahead and to wind ward, then Words Apart then us half a boat length behind and to leeward. Although we were all on starboard tacks and the Windward Leeward terminology fits in reality we were all running pretty square. Logic (Physics?) says that waterline length is a big advantage when yachts are running, the same logic says that the windward boat should have the advantage, but last evening we broke a few laws of logic and physics and were able to win the “Drag race” to the finish beating Worlds Apart across the line by 2 seconds with Saorise a further 9 seconds back. I hasten to add that Agrovation who crossed the line first followed by Izzi had crossed the line minutes ahead. I think I’ve written before that a place in the top 3 on scratch is about where we should be if we get most things right while a 4th is a satisfying result, the 3rd across the line last evening was most unexpected as it was achieved by being faster downwind than a couple of well sailed boats about 5 to 6 feet longer than us. Given that the wind generally was above 15 knots and we carrying a small headsail we had expected to be competative up wind but lose out on the runs and reaches the result was a bit unexpected. I cannot end this without thanking Dianne, Graham, Chris and Ann our exceptional crew and also Chis Stannard and Patrick Hooligan the skippers of Worlds Apart and Saoirse respectively who made on the run to the finish what could of been a very dangerous racing situation both enjoyable and safe, especially the communication between the boats which meant we could remain extremely competitive but also respect each other and avoid any potential problem, I’ve respected these guys for some time, there are not too many boats that I would feel comfortable with racing against in such close quarters but these two guys again confirmed (for what it is worth) our respect. We have been a bit tardy getting started this season, missing the first race of the Twilight season at GFS. We have had and followed a loose policy of not racing when there is a Strong Wind Warning in place for Sydney closed waters, there have been times when that policy was not followed, when we have had a full crew of experienced sailors on board or the forecast gave a definite indication that the warning was for a period that would end before or start well after the race period. The forecast for the 10th of October included a strong wind warning for Sydney closed waters, while it indicated that the wind could abate somewhat around race time we would be a small crew of just Dianne, Ann and myself, it was a no brainier to leave G-whizz on her mooring. As it turned out it was obvious that the wind could be quite light by our start, at about 30 minutes before race time Ann and I discussed getting out there and racing with just a reefed main and with minimal starters in our division (Blue or Div 5) we were assured of a good result. Fortunately sanity prevailed and we stayed at the club and had another drink. 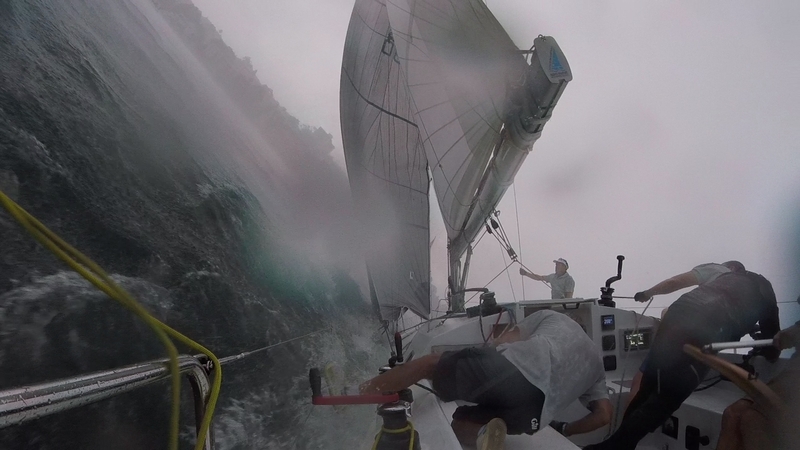 Race 2 was again held in conditions not typical of Sydney spring weather, a gusty nor’easter and rain. We had a crew of 4 and joined the other 7 seven starters. “Tom” (our cruising RFG) was on the furler and I thought it best to leave him there, especially as the wind was extremely variable ranging between 5 to 25 knots, the thinking being we could quickly shorten sail by furling the headsail. This decision dictated a fairly poor result with “Tom’s” pointing ability being some 10 to 15 degrees less than our racing headsails. A point driven home by a comment from Danni “If we had a racing Genoa up we would be pointing higher and going faster than those other boats”, we were all thinking the same thing. The only way to get a result was to do thinsg differently to the fleet, this worked well enough on the very short course around Cockatoo Island and then to the finish, we sailed higher on the run out of humbug while being out of the tide on the Eastern shore and in bit of a wind shadow, we lost quite a bit of ground to the fleet but it gave us an angle where we could broad reach past Clarke’s Point to the North western corner of Cockatoo Is. at which point we were up with the 2 leading boats. The next navigational difference from the fleet was to take a course through the wind shadow of cockatoo Is. while this sort of worked by travelling substantially less distant than the fleet that stayed in the pressure we lost a place or 2. This left us with a work back to the finish, with our diminished pointing ability it was satisfying to finish where we did, some great crew work with Chris on the main and Danni and Ann working the headsail winches we were always well trimmed and lost nothing in the tacks and gybes. All in all it was great to be back on the water after a long break and to finish a race in trying conditions without drama to or with boat and crew. 1 – The fickle winds that bend, test, gust and die for no apparent reason, affected by all the tall buildings on either side of the harbour and the funneling effect of the narrow channel at that point and probably others reasons that I don’t know or understand. 2- The washing machine conditions; it is almost is almost as if every bit of wash that bounces up and down the harbour meets under the bridge, bouncing off the deep and vertical walls that have been placed there and “improved’ on since colonisation of the area. 3- Circular Quay is the epicenter of Ferry activity on the harbour (Circular Quay is “Central Station” for Ferrys) and for those that don’t know a local rule gives Sydney Ferrys absolute right of way, and don’t some of the captains like to enforce it. – Have a look at all the ferry routes on the map below. Time for a caveat here the majority of Sydney Ferry Captains are the most considerate navigators on the harbour. 4 – It just gets busy with boats of all sorts, from International Cruise Liners to little tinnies controlled by masters with equivalent variation of ability. Then I look up and around, get my mind out of sailing mode and look at the scenery, and realise just how lucky are we to sail in this area. All this comment was generated when I came across a little video on You Tube that was uploaded a few months ago, it motivated me to pen the following an place it on the Video page of the site. The West Harbour Winter Series race 4 (17-Jun-18) was held in pretty gusty conditions, the course started and finished in the vicinity of Cockatoo Island proceeded down the Harbour around Fort Denison and return to Cockatoo Island with a little detour around Goat Island. we did not do too well on scratch (5th) but were lucky enough to get a first on handicap. 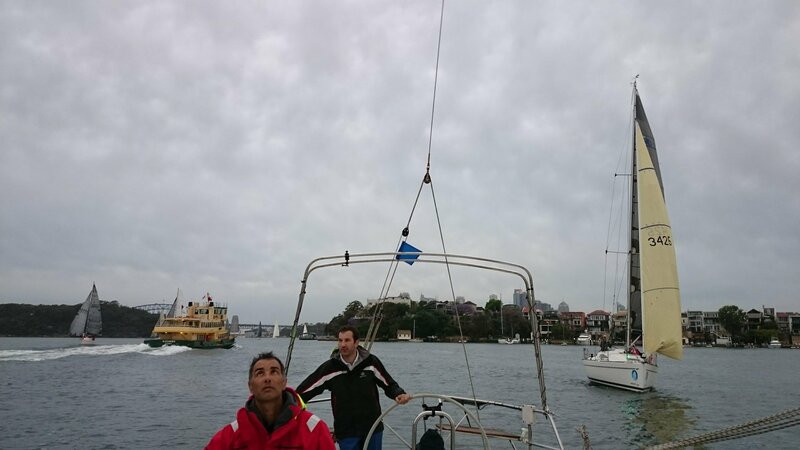 There is a pretty popular web cam on Sydney harbour (https://webcamsydney.com/) and the operators were good enough to record the period when the Western Harbour Winter Series fleet went under the Bridge and then returned, They then sped up the video and up loaded to You tube. We are in the third group of yachts heading towards Fort Denison, the only boat in that group with a black main and light coloured genoa. Its worth a look and reminds me of how privileged we are to have such a special sailing area. The forecast for today’s race was for winds in the low 20 knots, the first order of the day was to pick up the crew, go back to the mooring and prepare the boat for the expected wind. The mooring is in a fairly protected area that is only open the westerlies, and while there we had quite a discussion about sail choice, sitting in about 10 knots the choice was leaning towards “Reg” the heavy weight number 1, we were hit with a couple of gusts around 18 to 20 knots, which made the decision to use “Bas” the number 3. That only left fitting the first reef lines, as it appeared that this would also be needed (as it turned out it wasn’t). In light air we normally remove the reef lines to improve wind flow on the Main. After earlier announcing over the radio course 2 (Laps of Snapper, Spectacle and Goat Island) the race committee changed their mind and decided to send us on course 4 (Down Harbour, under the Bridge to Clarke island the back again with a little detour around Goat Island thrown in before finishing off the South Eastern Corner of Cockatoo Island). This meant a down hill start with a run to Clarke Island then a work back. After witnessing what could be described as some spinnaker carnage at the start of division 1 we decided to be a bit wary and let the fleet sort itself out and hopefully start a bit behind, unless as we all knew a hole opened up then we would take it, as it happened we were about 20 seconds late, however we were at the leeward end of the line and were able to make a lot of leeward ground which gave us some room the come up a bit in the (not too frequent) lulls. John had Hasta la Vista going really well and we followed them most of the way to Clark Island. To win the series we really had to beat Hasta la Vista across the line. On the work back up the harbour we were able to slowly pull in all but one of the boats ahead of us and just to confirm my dislike of racing under the Harbour Bridge, with it swirling winds and washing machine water conditions, we had a couple of close port/starboard’s that slowed us down a bit, we did call protest on one, but decided against going through with it as the conditions were a major influencing factor and the other crew were most apologetic. After finishing second place across the line we sailed back towards the mooring, dropping the sails along the way, normally I would drop the crew off at the club then put the boat on the mooring by myself before returning to club for a drink. Today we put G-whizz on the mooring with the whole crew on board, while that made putting her to bed easy and quick it did mean that we would have to relay the crew back in the dinghy, the first trip with 2 on board and all the bags, the waves were were breaking over the bow and we were taking on a bit of water, when I leaned forward to get the bailer from under all the bags my weight dipped the snub nose into the water, then it was instant submarine, although the gunnels were a few inches under the water, with me in the water hanging on Mark was still able to steer the Torqeedo to a position where we could extricate ourselves onto the Bay Street public wharf. Withe the help of the crew of Hasts la Vista the rest of our crew were able to get back to the club a bit safer and a lot drier than Mark and myself. A pleasant drink with compatriots on the deck of knowledge, a BBQed sausage and the news that our fifth on handicap was enough to win the series. Wow! Big thanks to the crew Rob, Graham, Mark and Joely for a great result. (I know I’ve missed a couple – my apologies.